The JustFundraising e-newsletter is a must-have for all coaches, league administrators, pastors, teachers, principals or other group leaders. 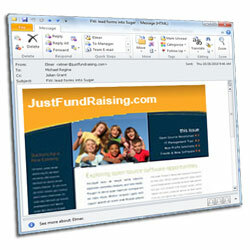 Each month, we'll email you valuable information to help you stay on the leading edge of fundraising. Get the latest success stories, new product features, extra special offers, helpful sales tips and a lot more! JustFundraising guarantees your privacy. If you'd ever like to stop receiving this monthly e-newsletter, simply click 'reply' and type 'UNSUBSCRIBE' in the subject line.